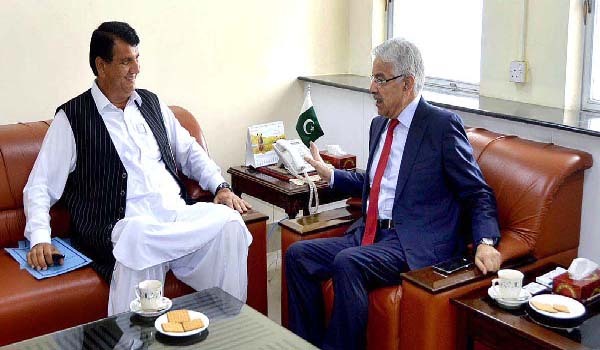 PESHAWAR, Aug 1 (APP): Advisor to Prime Minister Engineer Ameer Muqam Monday called on Federal Minister for Water and Power Khwaja Muhammad Asif and discussed with him matters relating to ongoing electricity schemes in KP. A press release issued here said that the federal minister assured Ameer Muqam that his ministry would ensure implementation of proposal and recommendation of the Prime Minister in that regard. He said that water and power ministry would continue to extend full cooperation and assistance in execution of electricity schemes in KP. He said it was the earnest desire of the prime minister that pace of work on electricity schemes in KP should continue with full swing so that people get maximum benefits from it. The ongoing political atmosphere in the country in general and KP in particular were also discussed during the meeting.